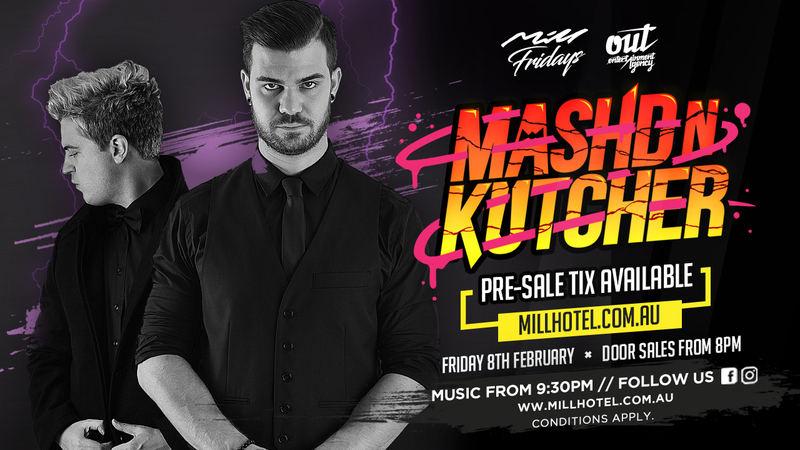 Mashd N Kutcher are taking over Mill Fridays February 8th for a MASSIVE LIVE PERFORMANCE! They've been voted Australia's #1 DJ duo, so you know this night will be insane! Lock in the date and secure your ticket now! UNFORTUNATELY WE CANNOT OFFER NAME TRANSFERS OR REFUNDS FOR THIS EVENT. PLEASE ENSURE YOU HAVE THE FULL NAME, DOB AND MOBILE NUMBER READY FOR ALL GUESTS ATTENDING. PHOTO ID AND PRINTED HARD-COPY TICKETS WILL BE REQUIRED TO GAIN ENTRY, DIGITAL TICKETS AND MOBILE PHONES WILL NOT BE ACCEPTED. DRESS REGULATIONS APPLY AT ALL TIMES. MANAGEMENT RESERVES THE RIGHT TO REFUSE ENTRY AT ANY TIME. NO REFUNDS. PLEASE ENSURE YOU HAVE THE FULL NAME AND DATE OF BIRTH READY FOR ALL GUESTS ATTENDING. NO NAME TRANSFERS OR REFUNDS.